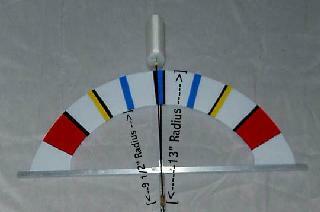 After several test models I settled on a 13: radius with a 3" offset for my wind indicator. This was a good compromise between readability, sensitivity and portability. 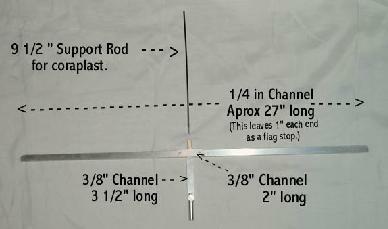 The 2" piece of 3/8" channel is used to strengthen cross member and provide support for 3/8" center rod. I uses pop rivets to attach this piece to the 1/4" channel, but small bolts or self tapping screws will work just as well. I drill a 1/4" hole through both pieces and elongate with a file to 3/8" for the flattened center rod. The 3 1/2" 3/8" channel provides additional support to keep everything square and supports the pivot shaft. 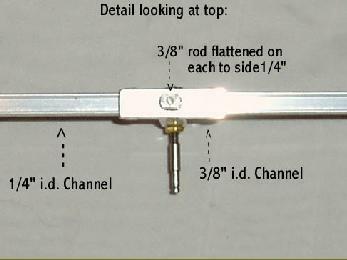 The 3/8" center rod is flattened on each side for 1 1/4" to a thickness of 1/4". Drill 1/8" hole 1" deep in the top end to hold the 9 1/2" support rod. Right picture shows the Brass Union and the shaft that is a key component of my 'Wind Indicators'. 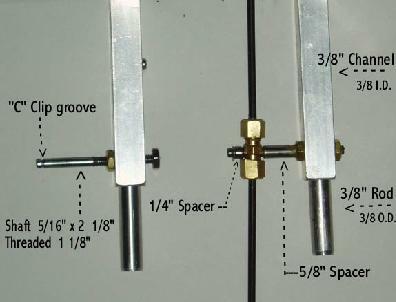 I make spacers out of telescoping portable TV antennas. I find the right size tube and cut to a length that will keep the Union and counter weight clear of flag and stand.